Customers have been wirelessly charging their mobile phones and accessories using over 12,000 Charging Spots in the public space and more than 4 million cars in the past few years. The seamless experience is undeniable, decreasing mobile battery anxiety and living life at 100% has never been easier. If you have any additional question, feel free to email us directly at networksupport@powermat.com. How do I wirelessly charge a phone that has built-in wireless charging? Powermat’s Charging Spots in public spaces are compatible with Qi, AirFuel and including fast charging capabilities. If your phone has built in wireless charging you do not need a ring and can simply charge by downloading the application, placing the phone on the Charging Spot and Tap to charge. How do I wirelessly charge a phone that does not have built-in wireless charging? Which smartphones have built-in wireless charging? For a list of wireless charging enabled phones, click here. Powermat’s Charging Spots in public spaces are compatible with Qi & AirFuel standards. Which smartphones require a Powermat Ring? Smartphones that are not equipped with built-in wireless charging require a Ring. The Ring is designed to charge smartphones with a Micro USB charging port or an iPhone charging port. This typically means the Ring supports Android based phones, iPhone 7 and earlier iPhone versions, Blackberry and Windows based phones. Can I charge iPads and tablets with the Powermat Ring? The Ring is not designed to charge tablets (although some tablets and iPads may be supported with slower charging). Can I use the Ring at home or office? Unfortunately, the Ring is not suitable for home charging mats. Can I use other wireless charging accessories on the Powermat Charging Spots? Any Qi or AirFuel certified devices can be charged using the Powermat Charging Spots. Given that the latest iPhone series only supports Qi, how does that affect compatibility with Powermat Charging Spots? Powermat wireless charging is fully compatible with the new Apple iPhone series. Powermat strives to support all standards, so consumers can effortlessly power up their smartphones wirelessly, regardless of what kind of device they own. How does Powermat update the Charging Spots already installed? Powermat’s wireless charging technology is connected to a cloud network allowing remote updates and real-time monitoring. When will the Charging Spots already installed be updated to support Qi? Powermat is working with its clients to coordinate the schedule update. Plenty locations have already been updated and the rest should be updated in the coming weeks. What is the Powermat Ring and how do I use it? The Ring is your key to wireless power. We made it extremely light and compact without sacrificing the capabilities of a normal phone charger. Simply launch the Powermat app, plug in the Ring, place it onto the Powermat Charging Spot, and Tap to charge. Why do I need the Ring? An increasing number of mobile devices already come with embedded wireless charging capabilities like iPhone X, iPhone 8, Samsung S8, Samsung S7, LG G6 and more. If your phone does not have it built in, you need the Ring in order to transfer wireless power from the Charging Spot to your phone. Where can I buy a Powermat Ring? Is the Powermat Ring Apple certified (MFi)? Yes, the Ring is MFi certified. Why do I need the Powermat app? The Powermat app works as your guide in the world of wireless charging. It makes the Powermat setup easy and reveals all the Powermat locations available to you when you’re out and about. The app also provides personalized offers and discounts from your favorite brands. The app is available for download in the App Store and Google Play. Visit our app page for more information. Powermat has over 12,000 Charging Spots available in the public space all over the globe. US, UK, Poland, South Africa and Australia are just a few countries where you can find our Charging Spots. You can easily and quickly access available Powermat locations by downloading the Powermat app, available for download in the App Store and Google Play. Visit our app page for more information. If my mobile device does not charge, what should I do? • Location based services are on for “Powermat” app. • Bluetooth is turned on. • The “Tap to charge” button is highlighted and enabled. • The app correctly identifies your location and the “Welcome” message displays the venue at which you are currently visiting. • You tapped on the “Tap to charge” button and then placed the phone on the Charging Spot. • Your device’s power requirements are compatible with the Charging Spot’s 1A/5V output. • There are no other objects on the Charging Spot. • The Ring is connected to your phone and the printed logo and the LED on the Ring are both facing up during use. • The Ring is placed in the center of the Charging Spot. To re-position the Ring on the Charging Spot, lift it up and place it back on the spot again. • Extremely thick mobile device covers may impede the Ring from reaching the charging area. If your phone has a cover, try removing it. 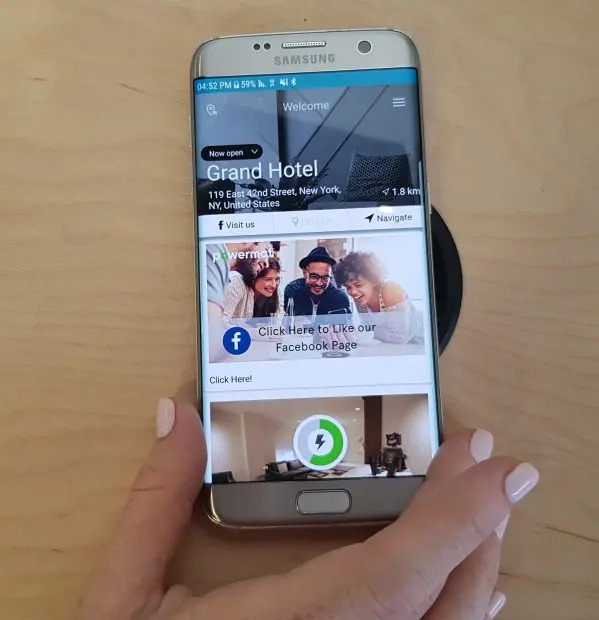 Powermat uses electromagnetic induction to transfer energy between a transmitter (Powermat Charging Spot) and receiver (phone with embedded wireless charging or Powermat Ring). Inductive charging has been around for decades. It is commonly used for charging electric toothbrushes and other small electronics. Inductive charging capacity has since increased, and we are now able to charge smartphones. In the near future we will also be able to charge tablets and laptops. This technology is very efficient and safe compared to regular wires in traditional power cables. How can I contact Powermat customer service? We’re always interested in your feedback and questions. Please email us at networksupport@powermat.com. We’ll get back to you as soon as we can.